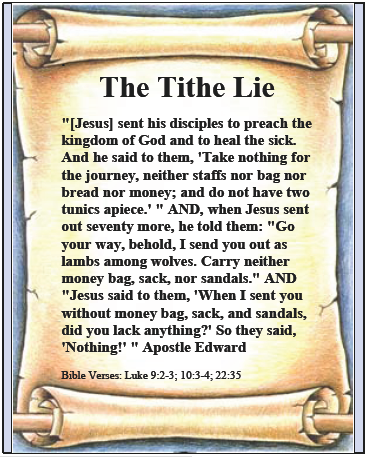 Apostle Edward | The Tithe Lie | The Tithe Lie Cover Page - Jesus Instructed His Disciples To Take No Money! "Will a man rob God? And prove Me now in this,"
This Scripture in Malachi is the basis of the tithe lie. It is a very powerful Scripture. Who among us wants to rob God? The experienced tithe preacher plays on our emotions to teach that we rob God in two distinct ways using this Scripture. First, we fail to tithe [give the Church 10% of our gross income], and second, we fail to give offerings [in addition to the tithe]. I have heard many tithe teachings that use Malachi, but this is not the only Scripture abused. I believed in tithing for a season. Anyone with a heart that wants to get close to God would be horrified to think they might be robbing Him. However, if they know God's Word, they can reject the tithe lie as a false teaching. They may also want to find a new teacher. At best, a tithe teacher is ignorant of God's Word. If they are not ignorant, then they are liars, because they know better than to add or subtract from God's Word. I can hear someone's voice saying: "Apostle Edward, aren't you being harsh calling tithe teachers either ignorant of God's Word or liars?" No, I don't think I am. I believe that those two characterizations fully explain tithe teachers, regardless of their pedigrees or popularity or size of their ministry. This will become fully apparent to you by the end of this tract. For now, consider some Scripture. FACT: False and ignorant teachers have existed from time immemorial, but in these End Times, it is ever more prevalent today. Scripture must fully support Bible doctrines! The above Scriptures make it clear that God will hold teachers to a higher standard. This higher standard is reflected in James 4:17. Every teacher of God's Word should know not to add or subtract from His words. This Scripture refers to a lover of lies, not a person who tells a white lie here or there. A complete discussion of the issue of lying can be found in the Book Of Edward, Volume I, starting at page 83. FACT: The tithe preacher lies about God's Word in Malachi 3 to raise money for their ministry and for their own personal gain. Nor a son of man, that He should repent. Has He said, and will He not do it? FACT: God has made it clear we are not to add or subtract from His Word. And that if we do, there are serious consequences. God has several issues with tithe teachers. If you teach tithing, consider this as a warning from God to stop perverting His Holy Word. · ADD to and SUBTRACT from God's Holy Word. · PERVERT God's Word for ministry and personal gain. · IDENTIFY yourself as a lover and practitioner of lies. · WILL BE ACCOUNTABLE to God's higher teacher standard. "You shall truly tithe all the increase of your grain that the field produces year by year. And you shall eat before the Lord your God, in the place where He chooses to make His name abide, the tithe of your grain and your new wine and your oil, of the firstborn of your herds and your flocks, that you may learn to fear the Lord your God always. [For whatever your heart desires]: for oxen or sheep, for wine or similar drink, for whatever your heart desires; you shall eat there before the Lord your God, and you shall rejoice, you and your household. You shall not forsake the Levite who is within your gates, for he has no part nor inheritance with you." "At the end of every third year you shall bring out the tithe of your produce of that year and store it up within your gates. There are Two purposes cited by God in the "Tithe Law" He gave the Hebrews. There are Three yearly instructions. 1. Year 1 – Consume your tithe before the Lord. Don't forget to bring the Levites to the worship celebration. 2. Year 2 – Same as year one. 3. Year 3 – Bring your tithe [food] to a storehouse so other people could eat. There are Five things God wants tithed. 2. Tithe the new wine. 3. Tithe the new oil. 4. Tithe the firstborn of your herds. 5. Tithe the firstborn of your flocks. God said to tithe against His Increase. "To Tithe" meant worshipping God and feeding His people. It did not mean giving 10% of one's gross income to a church. To tithe the firstborn of your flocks or herds meant that out of every 10 newborn animals, you were to give 1 as a tithe. Ergo, you did not tithe from the existing herd or flock, but only on the increase in that herd or flock that God gave you. Tithing never involved giving money. Immediately proceeding "Will a man rob God? ", we see that God is talking to the nation of Judah. The people of Judah did not obey God's ordinances on tithing. As a result, God's storehouse lacked food and the Levites did not give a heave offering. This was a "tenth of the tithe" [Numbers 18:26]. God instructs Judah through the prophet Malachi to obey the tithe ordinances and bring the tithe "that there may be food in My house" [v10]. God's food message is then reinforced by His words: "I will rebuke the devourer" [v11]. Ergo, God will provide great harvests for Judah if they obeyed Him. Note: I believe the Hebrews staggered their tithe so the storehouse was filled every year. Tithe preachers teach four lies in an appeal to our emotions of love, fear and greed. 1. The tithe applies to everyone. a. False – It applied only to Jews. b. Ask a Rabbi if Jews tithe today. 2. God requires you to give 10% of your income to the church as a tithe. a. False – It had nothing to do with giving money. It was about food. 3. God will curse you if you do not tithe. a. False – Tithing is of the law and ironically Paul teaches that the exact opposite is true in Gal 3:10. "Cursed is everyone who does not continue … to do all things [written in the book of the law]. 4. God will make you rich if you tithe. a. False – Tithing is now a curse! Some people think that godliness is a path to riches, but they are greatly deceived. The essence of today's tithe teaching is a give to get message taught to people who are ignorant of Scripture and who value their preacher's words over the words of God. These are intellectually lazy people who are emotionally programmed against God's Word. Verily I say they are truly deceived. As a result, many tithe preachers live lives of luxury renting hotel rooms for $10,000 per night, according to one documentary. Many drive expensive cars, own private jets and multiple homes in luxury locations, all while teaching their flocks that each of them can also live lives of luxury just by tithing! The tithe pitch is an effective money-raising tool, because it appeals to the raw emotions of love and fear. Then, it couples those two emotions with that of greed and its inherent desire for material things and wealth. There is no doubt that tithing is an appeal to human emotions and that it can cause many to be led astray, seeking friendship with the world and easy money! The pitch is as basic as the love of God, the fear of His curse, and the idea that He wants to give you all that your heart desires. This is a very seducing message to those ignorant of God's Word. And, any teacher who perverts God's Word teaching the tithe can reinforce the tithe message with countless Scriptures. Proverbs says it is God's blessings that will bring riches, not tithing. Even this verse can be twisted. Yet, in the face of the entire tithe lie come the words of Jesus Christ to his disciples. Let's now go back to where I started this tract, the words of Jesus Christ. Jesus Christ sent his disciples out without any money, and they lacked nothing! How could that be? Think carefully about what Christ has taught us in this regard, and reflect on the Scriptures I cited on the cover page of this tract for a little while. Ready to move on? It's quite a contrast, isn't it? Christ says we do not need money to be his disciple and an effective servant of God. Yet, many preachers now say they cannot be effective without tithes and offerings. Without money, how can we build a Church? Do you believe Jesus or the tithe preacher? There is no contest here, is there? You need to accept the words of God and His Son over any teacher. That includes me, if you should ever find His Word contradicting what I say. Let me tell you a secret. I firmly knew that the offering referred to in Malachi 3:8-10 was the heave offering that God required of the Levites. Remember, I taught you that it was "a tenth of the tithe." What you don't know is that I had actually taken it out, as I forgot the proof Scripture. I reasoned that if I couldn't provide a proof for you, this statement had to be deleted. However, God brought back to my memory Numbers 18:26, exactly where He gave the Levites these instructions. It was important to me that you know this was an offering from the Levites that God referred to and not something more required of the people who were to tithe at the time. The merchants of tithing would teach this as a second tithe to indicate God wants even more from you. However, it is God who called it "a heave offering" and defined it as "a tenth of the tithe." Well, back to Jesus. You might think Jesus is telling the rich young ruler that he won't get into heaven, but that is not true. Jesus already confirmed to him that he was assured of eternal life, because he obeyed the commandments. See Matthew 19:17-19. However, the rich young ruler said, "What am I lacking?" You might ask, "Why didn't Jesus didn't tell him to bring the money into his ministry?" Isn't that what a tithe preacher might say? Yes, it is. Bring in the cash brother! But Jesus had a different standard by which to build his Church. And while I am on that thought, how should a church get built today? Free will offerings should build it! To quote one scholar: "The old covenant society which Moses established at Mount Sinai, whether religious or secular, was supported (at first) simply by free will contributions. This is precisely the way the Christian Church was financed at first." Jesus knew something that modern tithe preachers don't know. Money is a master! Jesus knew that the rich young ruler served a master called money, even though he had assurance of eternal life. Jesus' statement about how difficult it is for the rich to enter the kingdom reflects the fact that money is a power that exerts control over our thoughts and can be a powerful master of our lives. How do you change masters? Give all the wealth away and follow Jesus Christ. In the process, you walk away from the things of this earth and focus on the things of heaven. When you walk away from the things of this world, you become a true servant of God. Your focus is on stewardship and not on the ownership of physical things, where money is truly a master controlling one's thoughts. Jesus knew money can buy everything, but without it you have to trust in God to get the job done that He wants you to do. This doesn't mean you won't have any money to work with. It means that God is the one you look to for resources, not a banker or anyone else. It is He that brings you what you need. Tithing is a lie used by Satan's ministers of righteousness to exact money, to lead us astray, to make us friends of the world, and make us an enemy of God. So, what are some biblical principles of giving that we can practice today? That is the final area I will address in this short tract. How should we give today? How do we give to God? 1. You choose the standard for receiving. 3. Give with a purpose in your heart. 4. Do not give out of necessity. 5. Be a cheerful giver. 6. Do your good deeds and giving in secret. 7. Understand that God owns everything. Do these six things to give directly to God. 3. Take in the stranger. 6. Go to those in prison.